Running any race takes dedication and diligent training. There are other differences between a 10K and a 15K, aside from the distance. If you run a 15K, you can expect to train longer and to train differently than if you were running the shorter distance. Once you know more about the requirements of successfully completing a 15K, you can determine if it is the right race for you. Running a 15K is naturally harder than running a 10K because you are required to run for a longer distance and a longer amount of time. A 15K race is 9.3 miles, and a 10K race is 6.2 miles. According to Bob Glover and Shelly-Lynn Florence Glover, authors of "The Competitive Runner's Handbook," running a 15K is very similar to running a half marathon, which takes more time and training for you to be conditioned enough to complete the race. A 15K also puts more stress on your body than a 10K, both in training and in running the actual race. This can increase your risk of injury. 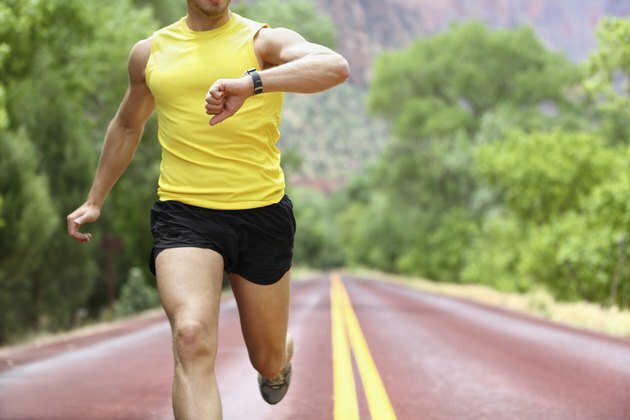 If you are running a 15K, you need to train longer than if you are planning to run a 10K. Brian Clarke, author of "5K and 10K Training," recommends a year for adequate training for any race because a year's time can prepare your body for the intense exertion. However, many people train for shorter amounts of time. When you train for a 15K race, you spend more time running -- as well as more time running at an intense pace -- than you would for a 10K race. If your goal is to finish first, you also need to increase your running speed by conditioning your body, over time, to run faster. This is done through intensive training that strengthens your leg muscles so that you are able to improve your speed. Engaging in different training activities throughout the week enables your entire body to be well-conditioned to undergo your chosen race. Clarke recommends training three days per week if you plan to run a 10K. He suggests running hills one day, doing intervals -- periods of intense activity, followed by periods of slower activity -- another day and going for long runs on the third day. A similar three-day training program is effective for a 15K, though you may need to engage in each activity for longer periods of time than you would if you are planning to run a 10K. On one day, you would go for a short run, another day you would go for a long run and on the third day you would do intervals. You should also rest on the other days to help your muscles repair themselves, so you are less likely to injure yourself. Consider your activity level before signing up to run a race. A 15K is considerably more difficult if you are not in shape or have not been running for a while. Gradually ease into your training sessions to help prepare your body to become more physically active, as well as to help you reduce your risk of injury. Running a 5K may be an effective way to begin training for a 10K, and running a 10K may be an effective way to train for a 15K. If you do injure yourself, take a few days off from training to allow your body to heal.